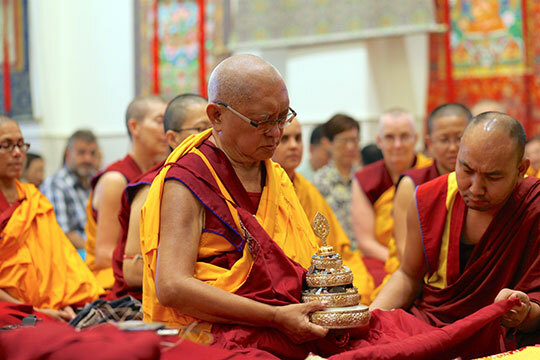 Lama Zopa Rinpoche during the long life puja offered on behalf of the entire FPMT organization at Amitabha Buddhist Centre, Singapore, March 13, 2016. Photo by Ven. Lobsang Sherab. Thank You, Friends of FPMT! Tenzin Ösel Hita offering to Lama Zopa Rinpoche during the long life puja offered to Rinpoche at Amitabha Buddhist Centre, Singapore, March 13, 2016. Photo by Ven. Lobsang Sherab. 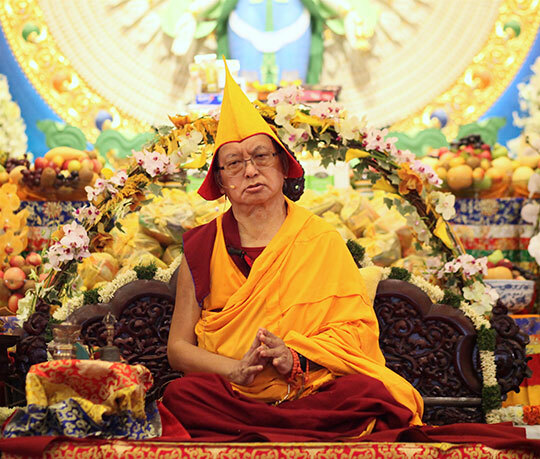 FPMT’s official long life puja offered to Lama Zopa Rinpoche. That all FPMT centers, projects, services, study groups and offices were represented, with more than 115 representatives flying in to honor the occasion! The inspiring praises offered to Rinpoche during the long life puja by Khadro-la, Tenzin Ösel Hita, and the praise on behalf of the entire organization. The 1,142,515 tsogs offered by students around the world! The 43 centers that offered long life pujas to Rinpoche locally, and the 24 centers that hosted the livestream from Singapore for the benefit of local students. Watch the video of the long life puja. 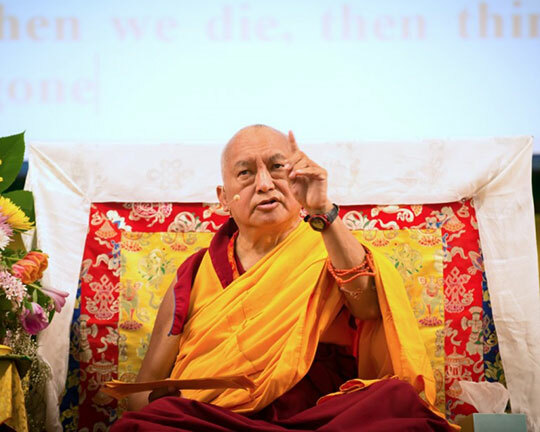 Lama Zopa Rinpoche teaching at the Light of the Path Retreat, US, 2014. Photo by Roy Harvey. 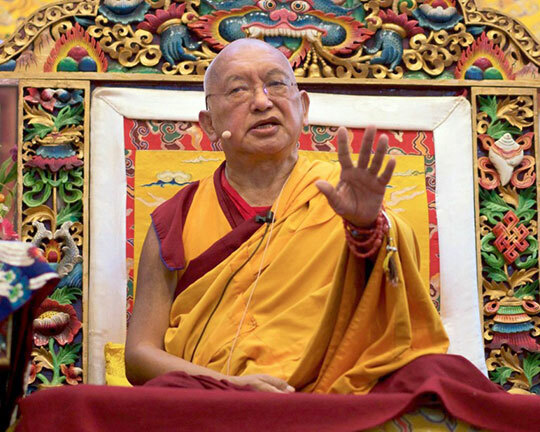 Lama Zopa Rinpoche teaching at Kopan Monastery, Nepal, November 2015. Photo by Bill Kane. Lama Zopa Rinpoche offering a mandala, Amitabha Buddhist Centre, Singapore, March 2016. Photo by Ven. Lobsang Sherab. The Preliminary Practice of Altar Set-up and Water Bowl Offerings has been revised and is now available in PDF format, or as an ebook available from the FPMT Foundation Store or Amazon Kindle Store. Lifelike statue of Lama Yeshe, FPMT’s founder, residing now at Vajrapani Institute, CA, USA. 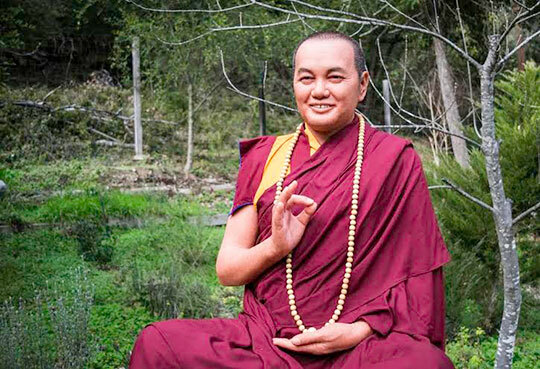 Since 2011, Vajrapani Institute has been working with others to create a lifelike statue of FPMT’s precious founder, Lama Yeshe. Lama Zopa Rinpoche advised that this new statue should live in Vajrapani’s new gompa (yet to be built), surrounded by 999 smaller replicas making the total 1,000. You can read more about this incredible statue, further plans for this project, and how the Lama Zopa Rinpoche Bodhichitta Fund has offered support. We are collecting offerings from Merit Boxes until March 31 for this year’s Merit Box grants. Merit Box grants are awarded to Dharma projects, services and initiatives around the world that further the mission of FPMT. You can submit your Merit Box offerings online here, or read about other ways to send them in. We now have over 200 new Friends of FPMT supporters who joined during our Losar campaign in February to help the Foundation’s activities, far surpassing our goal of 108 new Friends! Many thanks to and much rejoicing for our new Friends (and of course all of our current and past Friends of FPMT supporters!) who make a huge impact in our ability to share the Dharma and serve sentient beings. Learn more and join Friends of FPMT here. 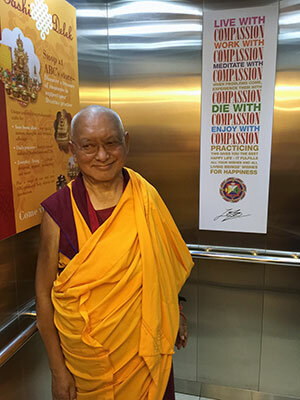 Lama Zopa Rinpoche next to the poster featuring Rinpoche’s “Live with Compassion” quote. Centers can download this as it is part of the FPMT Display Pack. Amitabha Buddhist Centre, Singapore, March 2016. Photo by Ven Losang Sherab. March 31st is the last day to submit your Merit Box grant application. Please contact meritbox@fpmt.org with any questions. The first Masters Program (MP) translation into Spanish has been completed by Ven. Nerea Basurto. Gyaltsab Je’s Commentary on the Ornament for Clear Realization, which includes the root text by Maitreya and the Indian commentary by Haribhadra, is now available from the MP Materials web page. Ven. Nerea continues with the next MP translation, the Middle Way commentary by Lama Tsongkhapa, Illumination of the Thought. Please enjoy this helpful compilation of key advice and new resources provided during 2015. FPMT Foundation Store is offering the 2016 Liberation Tibetan calendar with a 35% discount. Get yours today before they run out! Root Institute, Bodhgaya, India now has openings for an SPC and a Basic Program tutor.